Peter Capaldi battled numerous monsters and saved the universe countless times in his four years at the helm of the Tardis. But he never had a singsong round the old Joanna, did he? Which seems a shame because Capaldi is, I can reveal, a massive fan of Chas and Dave. 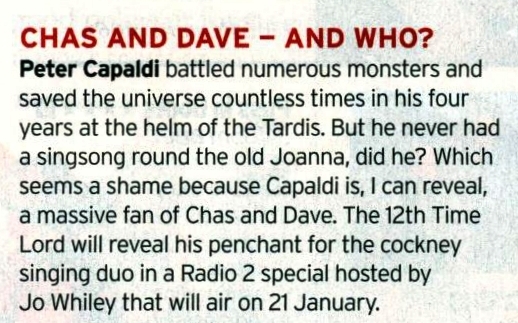 The 12th Time Lord will reveal his penchant for the cockney singing duo in a Radio 2 special hosted by Jo Whiley that will air on 21 January. APA 6th ed. : (2017-12-16). Chas And Dave — and Who?. Radio Times p. 6. MLA 7th ed. : "Chas And Dave — and Who?." Radio Times [add city] 2017-12-16, 6. Print. Turabian: "Chas And Dave — and Who?." Radio Times, 2017-12-16, section, 6 edition. This page was last modified on 30 March 2019, at 22:51.